Beltane sits opposite to Samhain on the pagan Wheel of the Year, with the former celebrated on May 1st and the latter on October 31st. The two rituals are the most important rituals on the wheel. They are both celebrated at a time when the veil between this world and the next thins, and it is easier to connect to those in the spirit world. But while Samhain is more solemn and is part of the transition to the long dark of winter, Beltane is joyous and part of the transition to the bright light of summer. Beltane means “fires of Bel” or “bright fires” and is Irish Gaelic in origin. Bel is a reference to the God Bel. Other names for Beltane are “Beltaine,” “May Day,” “Walpurgis,” “Roodmas,” or “Cethsamhain.” Beltane fires (fires of Bel) are used to symbolize the return of the sun, to bring fertility, and for luck. In the past, cattle would be driven between bonfires, for blessings as well as, according to Jeff McQueen, first-degree priest with the Wiccan Church of Canada, to rid them of pests such as lice. Cattle were then driven out to pasture for the summer and would remain there until Samhain. Many are familiar with the Maypole as a symbol of Beltane, and this symbol continues the theme of fertility and joy. Obviously, it is a very phallic symbol and, as this is a time for the God and Goddess to marry and procreate, dancing around the Maypole is used to represent that union. According to Louise Bunn, in her Book of Shadows: Participant’s Handbook for Wicca 101, the Maypole can also be said to represent the world tree, which takes a shaman to either the upper or lower world. 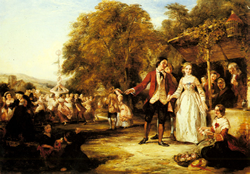 The dance around the Maypole, according to Bunn, also symbolizes the dance of death and rebirth. The Beltane ritual is such a happy, light, and fun ritual that many people allow their children to participate in it. We dance around the Maypole and as the ribbons get shorter, the laughter and merriment increase. One by one, people run out of ribbon length. They tie off the end to the pole and step away. The effect is always a beautiful crisscross of colour, the result of a breathlessly joyful spiral dance. Ostara precedes Beltane on the pagan wheel of the year. Ostara is celebrated at the spring/vernal equinox and is a time of hope and renewal, as the world begins to awaken from its long winter sleep. Litha follows Beltane on the wheel and celebrates the summer solstice, the longest day of the year. Litha sits opposite to Yule, which celebrates the longest night of the year.